Stage 11 of Le Tour 2014 was a lumpy ride along the Franco-Swiss border, with four minor climbs near the end. Everyone figured it would be a stage for Peter Sagan, and it was, but Tony Gallopin powered out from a late break to win by a whisker, leaving Sagan frustrated again. 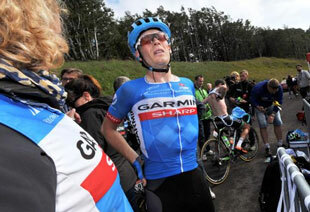 The GC was largely unchanged, but a big story of the day was Andrew Talansky's desperate battle to finish inside the time limit, still suffering badly from a series of crashes. He barely made it - yay! - and was cheered across the line by a crowd which waited over 30 minutes after the leaders had finished to cheer him on - yay! - but whether he'll be able to continue is doubtful. And his GC hopes have been dashed entirely. Tomorrow's stage 12 will be a bit more of the same: more lumps, four more climbs, and another chance for Sagan. Stay tuned!